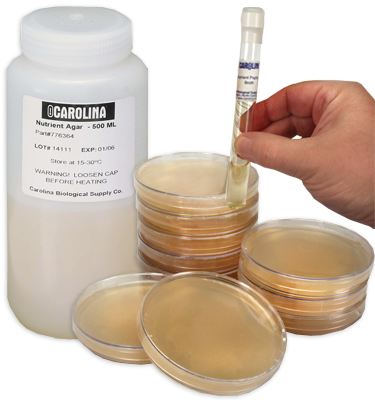 Photobacterium Agar, Prepared Media Bottle, 125 mL is rated 4.5 out of 5 by 2. Designed for use with Vibrio fischeri bacteria. No autoclave needed. Each bottle of bacteriological medium contains 125 mL of ready-to-use material. This amount is sufficient for pouring up to 5 plates or 15 to 20 tubes. The bottle is sealed to prevent contamination and drying. Prepared Media Bottles are 100% Satisfaction Guaranteed. Note: The species listed is not an inclusive list and is provided to assist novice users in selecting compatible media and bacteria. Sediment usually occurs in this medium. Rated 4 out of 5 by Britishkid from Works very well, keeps cultures alive for 2+ weeks not days! This is the easiest way to get V. fisceri growing without spending a bunch of time and money deciding on the best medium or buying all the reagents and making some yourself. Easy to use, pours well but word of warning, DOES NOT REHEAT WELL. I strongly suggest that you instead, just use all of it, pour as many plates as you can then seal them and keep them in the fridge as it's nearly impossible to get it to fully liquidate again even with a strong microwave or hours of boiling as per instructions. Amazingly, out of my 5 plates, three of them are still alive and visibly glowing (albeit not much) almost two weeks later! This is just as well because if you wait to order your 2nd bottle then they might well be dead by the time it arrives. Ignore the time it says the shipping will take, they will take at least that long again just to put it in the mail and that's assuming you order it at the beginning at the work week. I was furious with how long it took as my cells were very nearly dead by the time it finally arrived. In conclusion, while this is an awesome product, if I had another choice of company that put a bit more effort into getting things sent within a reasonable period of time then I would honestly not buy from this company again. Rated 5 out of 5 by Microbiologistish from Grew the photobacterium as promised Melting the agar on the stovetop required patience, but poured into plates and cultured the V. fischeri just fine.